This English duck breed was first recognized as a domestic duck breed over 60 years ago in 1941. Khaki Campbells are an ideal duck breed for those raising ducks for eggs. The Khaki Campbell duck breed makes such good duck egg layers that it often outranks chickens at rate of lay: 300 duck eggs annually! While the Khaki Campbell duck breed makes a good duck layer, it makes a terrible meat bird due to its light, lean weight. Khaki Campbell ducks also make nice ornamental additions to your backyard duck collection. 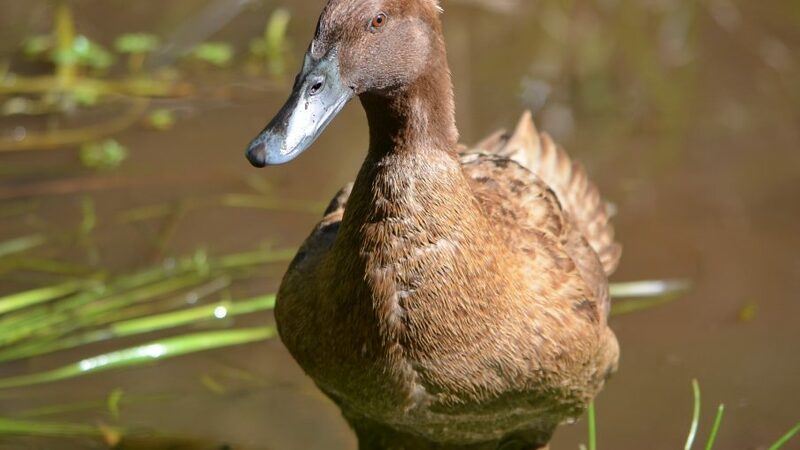 The Khaki Campbell duck breed has an interesting breeding history! Duck breeder Adele Campbell bred a White Indian Runner Duck with a Rouen duck. The ducklings from this breeding attempt then bred with Mallards, resulting in the modern Khaki Campbell duck breed. The Khaki Campbell duck breed was first presented to the public duck raising world in the late 1800s. Khaki Campbells were named because Adele Campbell thought the color of the ducks’ plumage looked like the same color used in the British army’s standard uniforms. Many backyard duck hobbyists raise Khaki Campbells because Khaki Campbells are easy to raise, relatively calm birds and lay lots of eggs. Khaki Campbells, due to their Indian Runner ancestory, make very excellent layers. In fact, they can lay more than 300 eggs every single year! Raising Khaki Campbells: This duck breed is relatively light in weight and do not make good meat birds. Adult Campbells can reach a weight as heavy as four pounds, but rarely more. Khaki Campbell ducks can eat regular duck feed, as well as forage on free-range grass pastures. If you wish to brood and hatch Khaki Campbell ducks, it takes 28 days to hatch the Campbell duck’s eggs. Other information about hatching Cayuga duck eggs can be gathered in our hatching duck eggs article. If you’re looking for another type of duck breed, consult DuckHobby.com‘s free list of duck breeds. Learn more about the Khaki ducks: All Breeds of Poultry, Origin: History: Description, Mating and Characteristics, by Frank L. Platt. Published by AMERICAN POULTRY JOURNAL, Chicago, Illinois.